Bowlers Rock Light was built in 1868 on the Rappahannock River between Bowlers Landing and Suggetts Point in Virginia. The lighthouse was a rectangular screwpile lighthouse. 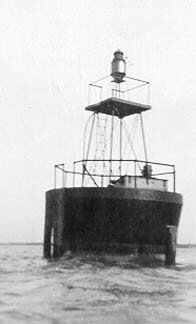 The lighthouse had two additional fender piles, set one on each of the ebb and flow sides of the structure, for additional stability against ice. Two lightships were stationed here prior to the lighthouse. The first was stationed there in 1835, which was burned by the Confederates in 1861. Then another lightship was stationed there in 1864. The lighthouse was destroyed by ice around 1918; deactivated in 1920 and dismantled. In 1921 a small automatic light near the original site replaced it with an acetylene light and automatic fog bell operated by carbon dioxide gas built on a caisson structure. The current light can be viewed from shore at the marina near Bowlers Landing, Virginia. Photo courtesy U.S. Coast Guard (present structure).